Jennifer specializes in post-grant review of patents and patent prosecution in the electrical, computer software, and electromechanical arts. She works closely with her clients to understand their technology, their competitors, and the marketplace’s demands. Combining this information with her keen business sense, Jennifer assists clients in building patent portfolios that add value to a company both in the short and long term. She adeptly navigates her clients’ patent applications through the U.S. and foreign patent offices to obtain the best possible scope of protection while still limiting examination expense. Although Jennifer works in a variety of technology areas, she has extensive experience in encryption and authentication, pneumatic conveying, financial services, optics, digital surveillance, payments systems, medical devices, aerial devices, and GPS systems. Jennifer regularly negotiates and drafts license agreements, prepares invalidity, non-infringement, and freedom to operate opinions, and negotiates settlements of various types of intellectual property disputes. Jennifer advises clients on copyrights in software and how best to maintain their copyrights. Jennifer has significant experience conducting post-grant proceedings in the U.S. and Europe. She is lead counsel on the first inter partes review filed under the America Invents Act. She has prepared and conducted numerous ex parte and inter partes reexaminations and participated extensively in European oppositions, including as lead U.S. counsel in opposition proceedings at the European Patent Office in Munich, Germany and The Hague, The Netherlands. 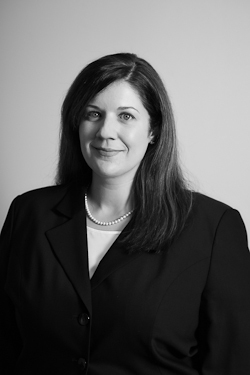 Jennifer’s post-grant experience stems from her years litigating in all pre-trial phases of patent litigation, including discovery, summary judgment motions, claim construction (Markman) motions, and related hearings. Jennifer is the immediate past president of the Association of Intellectual Property Firms, which is an international association of law firms that devote a majority of their practice to intellectual property law. She taught as an adjunct professor of patent law at the University of Missouri-Kansas City School of Law and as a mathematics instructor at the University of Missouri-Columbia. She frequently speaks on intellectual property issues and is a source for a number of news articles regarding intellectual property. Jennifer has been named as a Rising Star in intellectual property for the Kansas and Missouri regions by Super Lawyers for the past six years (2010-2015). No more than 2.5% of attorneys in a particular state are named as Rising Stars. Panelist, Top 5 Techniques for Software Patent Applications Post-Alice, IP Watchdog and Innography Webinar, December 10, 2015. Speaker, Maximizing Return on Investment: Prioritizing Legal Expenditures While Insuring Ownership and Compliance of Your Company’s Intellectual Property, BKD’s 14th Annual CFO Seminar, Kansas City, Missouri, October 29, 2015. Moderator, Effectively and Efficiently Working with In-House Counsel, Association of Intellectual Property Firm’s Annual Meeting, Toronto, Canada, October 2, 2015. Speaker, IP Provisions for Business Contracts that Every Non-IP Attorney Should Know, Two-Part Webinar Series, Kansas Bar Association, January 28-29, 2015. Panelist, Strategic Considerations Before Kick-Starting an IPR, American Bar Association’s Center for Professional Development, Section of IP Law, December 16, 2014. Panelist: AIA Pioneers and Post-Grant Proceedings, Association of Intellectual Property Firms’ Annual Meeting, September 29, 2014. Speaker, AIA Post-Grant Patent Practice Conference, International Intellectual Property Institute, Arlington, Virginia, February 19-20, 2014. Speaker, Conducting Inter Partes Reviews Under the New Rules: Reflections on Inter Partes Review No. 1, Lawyers Association of Kansas City, January 22, 2014. Speaker, IPR Proceedings at the USPTO—Strategic Approaches to the New Patent Proceedings, Law Seminars International Telebriefing, November 12, 2013. Author, New Approaches in Navigating Patent Law: Lessons Learned from the First Year of Inter Partes Reviews, originally published in Landslide, a Publication of the American Bar Association’s Section of Intellectual Property Law, November/December 2013. Speaker, Drafting Software Development Agreements, Association of Intellectual Property Firms’ Annual Meeting, Washington, D.C., October 1, 2013. Speaker, Fighting It Out in the Patent Office; Early Experiences and Observations About IPRs, Boston Patent Law Association, June 19, 2013. Speaker, Best Practices for Preparing and Responding to Requests for Reexamination, Lawyer’s Association of Kansas City, December 3, 2010. Author, Rethinking Patent Litigation: Can Reexaminations Position the Patent Infringement Defendant as the Aggressor?, originally published in Intellectual Property Today, September 2010. Speaker, Negotiating & Drafting License Agreements in Anticipation of Patent Validity Challenges, Kansas City Metropolitan Bar Association, Kansas City, Missouri, October 27, 2009. Panelist, Recent Patent Law Developments for Business Lawyers, American Bar Association’s Annual Meeting, Chicago, Illinois, August 2, 2009. Panelist, Practicing Ethically in the Electronic Era, Association of Women Lawyers, May 19, 2009 (Featured Speaker Regarding Litigation Holds in the Electronic Era). Speaker, Media Law, University of Missouri – Kansas City, February 2008 and March 2009. Speaker, The Ethical Pitfalls That Arise in Intellectual Property, Kansas City Metropolitan Bar Association’s Annual CLE By the Hour, June 27 and 30, 2008. Speaker, The Ethical Pitfalls That Arise in Intellectual Property, University of Missouri – Kansas City’s Annual Review of the Law, June 20, 2008. Speaker, Mastering the Basics of Software Patents and Copyrights, Kansas City Chapter of Independent Computer Consultants Association, May 27, 2008. Speaker, Intellectual Property Primer for the Corporate Counsel, University of Missouri – Kansas City’s Annual Review of the Law, June 2007 and June 2005. Speaker, Ethics in an Intellectual Property Law Practice, Kansas City Metropolitan Bar Association’s Patent, Trademark, and Copyright Committee, June 14, 2006. Speaker, Intellectual Property for Business Owners, Johnson County Community College’s Entrepreneur Series, March 8, 2005.